In the Odd One Out house, of course it is natural that we have some odd wee things lying around. 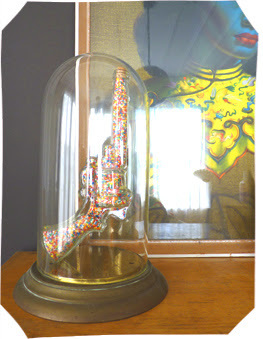 I think that this glass gun filled with 100s & 1000s would have to be up there as one of the oddest though! We found the gun at a vintage shop and I fell in love with it instantly. I am really drawn to objects that are contradictory or made from unexpected materials - and what could be more so than a glass gun! I have no idea what it was in a past life - perhaps someone out there knows? If you do please leave a comment, I would so love to know what use a glass gun would have had. Perhaps it was just made to be pretty & pretty it is! It didn't come with the sprinkles inside - that genius idea came when we decided to display it inside this vintage glass dome (another of my favourite things). 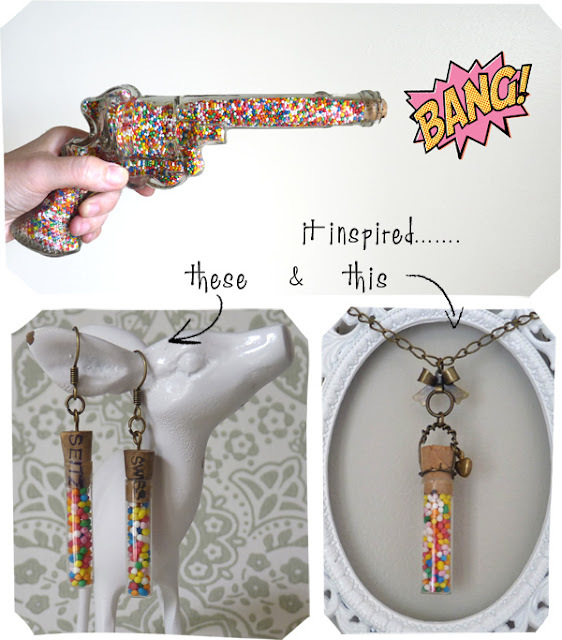 The glass behind glass idea didn't really work visually - so being the sweet toothed girl that I am, I thought 100s & 1000s would be a perfect way to make the gun stand out. I love the bright colours and that it adds another unusual element to the gun motif. Best of all the colours look awesome next to my vintage Tretchikoff! I am always being inspired by the stuff around my house - so it wasn't long before I started to make some jewellery pieces using this idea. These vintage glass vials were from the estate of a watchmaker and used to hold all the teeny tiny watch parts - I think they look so cute with the sprinkles inside! A perfect gift for a girl with a sweet tooth like me! I have been making these since I launched Odd One Out and they are one of my most popular items. Like them? Buy them here.